I wanted a super wide angle lens for my film bodies. Ended up getting the Sigma 15-30 last year. But I don't like the fact that it has no front filter thread. Polarizers are great for film or digital and 81a/81b filters are a must with film. I'm looking for something with an aperture ring that won't break the bank. What about the 18-35 AF-D? 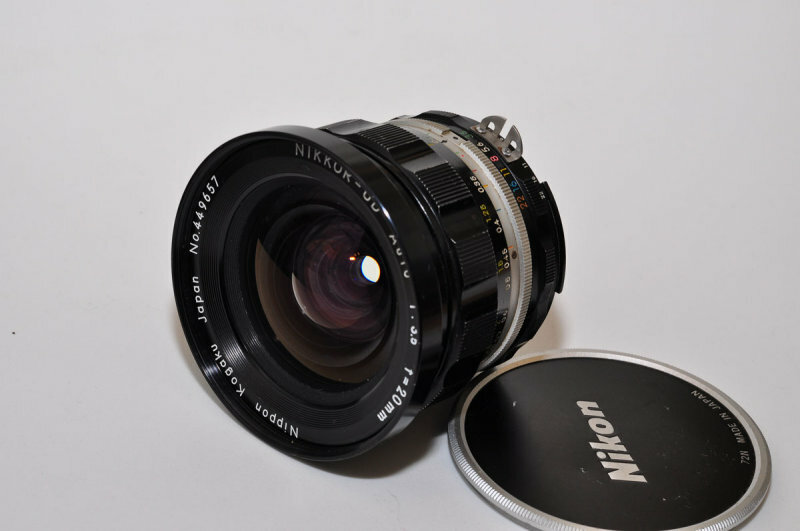 Or one of the 20mm lenses, MF or AF? Something in the price range that selling the 15-30 will come close to paying for. I have the 18-35 AF-D it is a solid lens but nothing special. The newer 18-35 G is supposed to be a stellar performer. Thanks James. The 18-35 G is priced very high and doesn't have an aperture ring, making it a "limited use" or "anti backward compatible" lens. True I never thought of that. If I had a choice of the 20 f2.8D vs the 18-35D I would choose the 20 f2.8D or the 18 f2.8D. Another thought is the 20-35 f2.8D zoom it is a pro grade zoom with excellent results. There's also the 17-35 f/2.8 AF-D, which is still manufactured. Yes I like the 20-35, but it's out of my price range. And doesn't the 17-35 cost over a grand used? I remember when you could get a good used car for a 1000 bucks. Good glass holds it value. That should tell you something. I've got the 20/2.8D and would recommend it highly. how about one of the AI/AIS 18mm or 20mm lenses? might work into a tight budget a bit better. Edited by Keith M, 15 July 2014 - 06:17 AM. The Tokina 17mm lens is also supposed to be pretty decent. I haven't used it though. Me three. That's why I have one. But it's the old-skool f/3.5 SL. I'm looking at getting a 20 2.8D. It's lighter and smaller than a wide angle zoom. And has a small 62mm filter thread. A used one is not that much cheaper than a new one. Right now I don't own a lens that I bought new. So in the years to come I can look back at it and say "I got that one in the days when you could still get a new AF-D lens." Surprisingly it's less than the AI-S. That one is about 100 more. I have the 20/2.8D and the 20/3.5 Nikkor-UD, ai converted. The latter is big, uses a 72mm filter. Wide-open on the DF, it's nice- also well-balanced. Hi Brian. I've looked into the 20 3.5UD, but it's big. And the great thing about the 2.8D is it uses the bayonet hood. Which means you don't have to screw the hood to the filter and make it stick out causing vignetting. So it's probably a better choice than the MF 20's if you plan on using a filter and hood at the same time. Edited by LightMeter, 17 July 2014 - 09:59 AM. I really like the 20mm F3.5 UD! It's not perfect but it has character. That's worth somehing to me. I ordered a new 20 2.8d and the hood this morning. Now l can feel guilty for the next few days about spending that much money. I was in arches early morning and I was shooting the fog around turret arch. A guy walked up, also with a Nikon F100 and said how do you like your F100 and we started talking. He had the 20mm and said, want to use this. So, I shot a few shots with it, moved around, he shot with my 24mm. It was cool. Gave him his lens back, shock hands, exchanged first names, Dennis/Tom, and parted ways. Later, I found out it was Thom Hogan. Thom Hogan-wow! So you didn't know it was him when you were talking to him? And how did you find out who he was later? I take Thom's site much more seriously than that guy with the initials KR lol. Edited by LightMeter, 18 July 2014 - 11:20 PM. Yeah, during our brief talk, I didn't know. It was 1998/9 and I only knew him by name. Later years I found his website. As u was reading some article of Hus, he mention its his normal to walk up and take to folks. That's when I put 5 & 6 together and saw his picture.